"Sometimes, life gives you a choice: accept the lot that is given to you or stand up for who you are and what you believe." The world of Arkham Horror has always united people from different backgrounds, brought together for a common cause as they seek to unravel the mysteries of the universe and protect our world from maddening creatures and vengeful gods that threaten our reality. 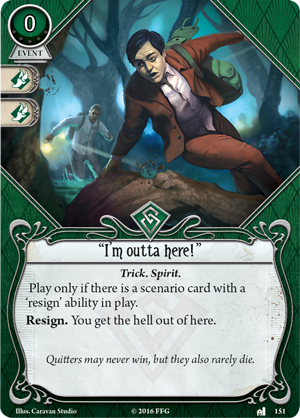 As the story of Arkham Horror: The Card Game has progressed, players have had the opportunity to embody their favorite characters from other games in the Arkham Horror Files universe, or those they have only met in the stories of The Investigators of Arkham Horror. In The Forgotten Age, players have the chance to step into the shoes of five investigators as they make their first appearances in Arkham Horror: The Card Game. 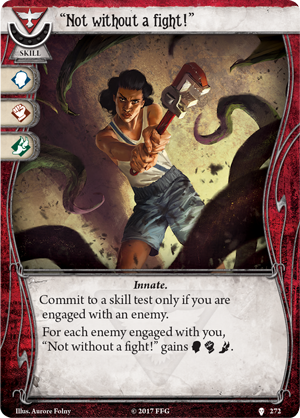 Ursula Downs was the first to join the expedition in the cycle's announcement, and we met Leo Anderson and Finn Edwards in our last preview. But on the expedition roster, there's one name you may not recognize: Calvin Wright. 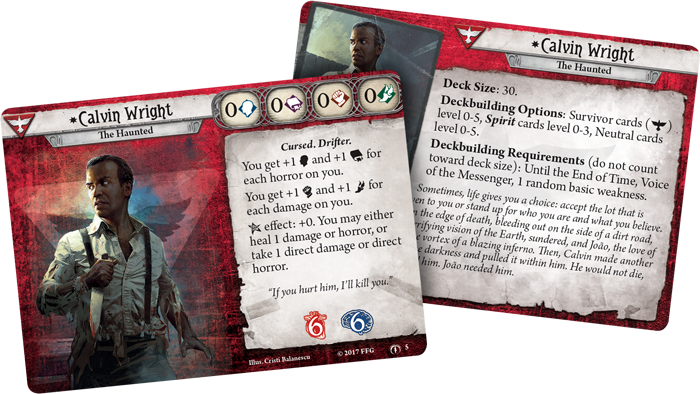 Calvin Wright is a new investigator to the Arkham Horror Files universe, having only made a special guest appearance at an Arkham Horror event in ages past and recently appearing in Elder Sign: Omens of the Pharaoh. Calvin is a man haunted by a dark vision, and there is only one person who can give us true insight into the character of this Arkham newcomer. Today, Fantasy Flight Games is pleased to meet with designer Matt Newman as he gives us a look into the creation of Calvin Wright and how this cursed innocent fits into The Forgotten Age—available for pre-order at your local retailer or on the Fantasy Flight Games website here! 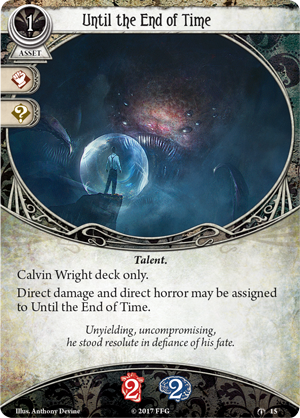 Having made his new debut into the Arkham Horror Files, we are proud to announce that Calvin Wright is coming to Arkham Horror: The Card Game in the upcoming deluxe expansion, The Forgotten Age! Today, I’d like to give you a peek behind the curtain, and tell you about Calvin Wright’s design, his origins, and some of the challenges we faced throughout the design process. Calvin made his original debut as a promotional investigator for a special Arkham Horror event many years ago. 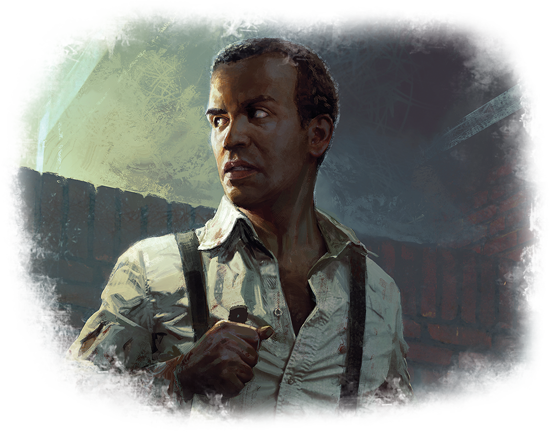 Most players never got the chance to play with Calvin, so we wanted to add him to the official roster of investigators across all of our Arkham Horror Files games. We decided to take this opportunity to expand Calvin’s backstory and themes of sacrifice and altruism that make Calvin unique among other investigators. As somebody haunted by the Mythos and beset by danger on all sides, Calvin is the archetypical Survivor, armed with nothing but grit, and driven by his desire to protect the one he loves. While his selflessness might have pushed Calvin’s ideology toward the Guardian class, we wanted to make sure Calvin had an ability that was useful in solo play as well as in multiplayer, so we decided to focus less on his martyrdom and more on his curse. With that in mind, almost every version of Calvin we designed started with the same sentence: “The worse things get, the stronger Calvin becomes.” This fits like a glove with the overall themes of the Survivor class, and also happens to fit Calvin’s art and flavor perfectly. Our first iteration of Calvin dealt with weaknesses. His ability gave him a benefit whenever he drew a weakness, and his signature cards included several copies of a rather tame weakness. The idea was that Calvin was cursed to continually draw lots of weaknesses, but his ability made up for that drawback. While intriguing, this version was scrapped pretty early in the design process. For one thing, we felt that players should never actually want to draw weaknesses—it diluted the themes of the game. More importantly, his ability merely offset the penalty for having so many weaknesses, so he didn’t feel like he had any real strengths. 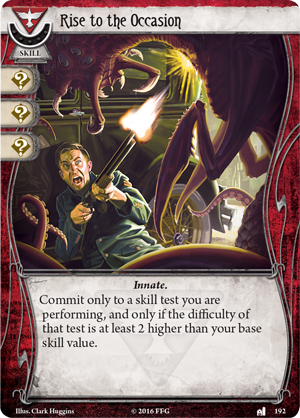 While we may eventually revisit the idea of a weakness-focused investigator, this version simply wasn’t working, so we tried something else. Our next version of Calvin was one who grew stronger for every card in his threat area. While the concept was solid, the execution often led to odd situations. For example, while engaged with an enemy Calvin would get a bonus to his skills, which he would likely use to fight or evade that enemy, thereby losing the bonus. Bonuses to other skills (like intellect) would typically be wasted. On the other hand, Calvin would have strange (and sometimes quite powerful) interactions with certain treacheries. 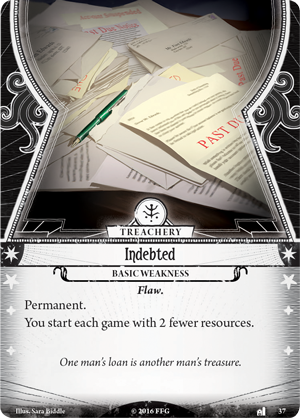 A weakness like Indebted (The Dunwich Legacy, 37), for example, never leaves your threat area, and therefore provided Calvin with a permanent bonus. While we didn’t end up using this effect for Calvin himself, we took inspiration from this version of Calvin and incorporated the idea into the Survivor skill card "Not Without a Fight!" (Black Stars Rise, 272). We noticed that the most fun part about these previous versions of Calvin was the idea that his skills started lower than usual, and scaled upwards from there. This brought us to our final and most interesting version of Calvin—the one included in The Forgotten Age. Along with doom, damage and horror are often used as indicators of how close an investigator is to defeat. Therefore, if Calvin was to grow stronger the closer he was to defeat, it made sense that he would grow stronger as he took damage and horror. He compensates for this powerful ability with extremely low starting skills and lower overall health and sanity than most investigators. This version of Calvin proved to be the most fun to play and build decks around. It challenges players to find ways to boost his skills while staying alive, or to take advantage of his low starting skills. It is no accident that Calvin’s base skills of ‘0’ allow him to commit cards like Rise to the Occasion (Blood on the Altar, 192) during almost any skill test, or react to failed skill tests with cards like "Look What I Found!" 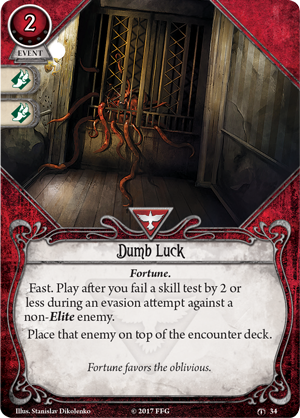 (Core Set, 79) or the brand-new Survivor event, Dumb Luck (The Forgotten Age, 34). We eventually found that Calvin players gravitated towards two very different styles of Calvin decks—those that embraced risk and took as much damage, horror, and trauma as possible in order to maximize his skills, and those that played a longer game, taking advantage of Survivor’s “fail-to-win” cards to get through the early parts of a scenario. Observing these play styles led to the creation of Calvin’s two signature cards. His signature asset, Until the End of Time (The Forgotten Age, 15), was created to help Calvin take some extra damage and horror while keeping his actual health and sanity values the same. It’s a simple and cheap card that is easy to play, while still having a unique effect no other card can claim to have: the ability to take direct damage and horror. Since we like to have signature weaknesses interact strongly with an investigator’s ability, we knew Calvin’s weakness should deal damage or horror, making it a double-edged sword that both hurt and helped him. However, we decided to take it one step further. We noticed that players often embraced risk when playing as Calvin, since being defeated and taking trauma only made him stronger in future scenarios. 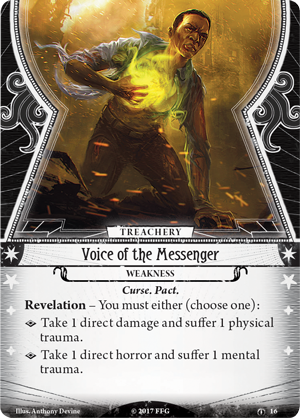 As a result, Voice of the Messenger (The Forgotten Age, 16) became the first weakness in the game which directly inflicts trauma on an investigator. It’s still a double-edged sword, but now it’s a double-edged sword that can get real sharp over the course of an eight-scenario campaign! Last but not least, we had to decide on Calvin’s deck building requirements. I wanted Calvin to be a primarily mono-class investigator, relying on Survivor cards to emphasize his themes. 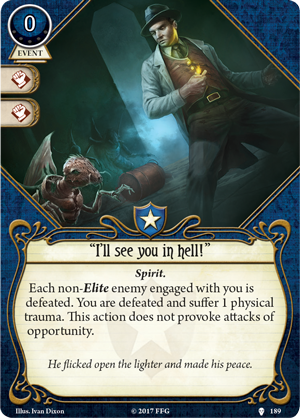 However, there was a particular trait on some event cards that I feel embodied Calvin’s personality: Spirit. These are cards which emphasize an investigator’s courage and resolve, and many of them have amazing synergy with Calvin’s ability. 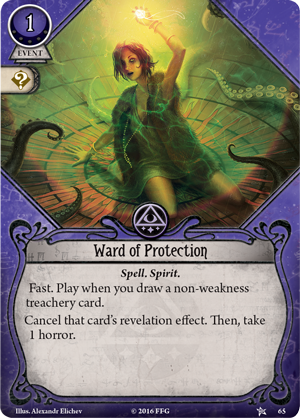 For example, use Ward of Protection (Core Set, 65) to cancel a revelation effect and take a horror, thereby raising his mental skills. 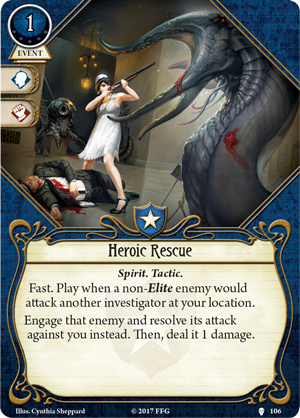 Or use Heroic Rescue (Echoes of the Past, 106) to engage an enemy that would attack a friend, resolving its attack on you instead and boosting your skills in the process. About to be defeated? Use "I'm Outta Here!" (The Essex County Express, 151) to resign without suffering trauma, or play "I'll see you in hell!" (A Phantom of Truth, 189) to take some monsters out with you. Sure, you’ll take a physical trauma, but that will only harden your resolve. 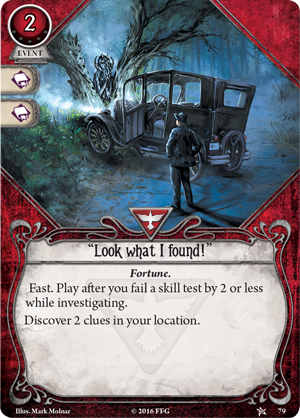 I hope you’ve enjoyed this look into the design process for an investigator in Arkham Horror: The Card Game. Calvin has quickly become a favorite of mine, and I look forward to seeing what strategies and combos players will come up with when playing as him! Thanks, Matt! 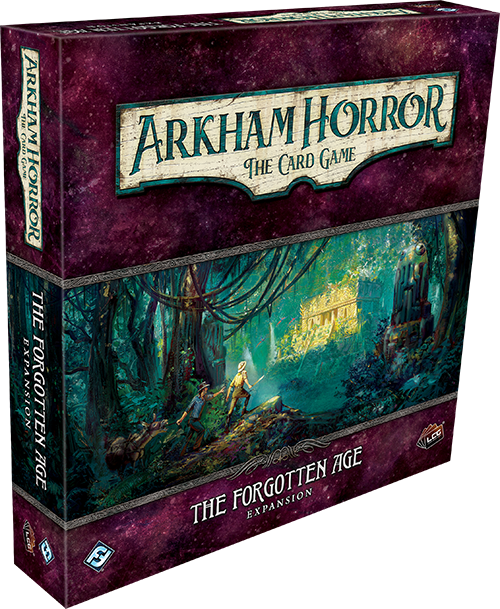 Calvin Wright will make his grand entrance into Arkham Horror: The Card Game shoulder to shoulder with the four other brave investigators of The Forgotten Age as they embark on the adventure of a lifetime. Will Calvin discover the cause of his vision and prevent it from coming to pass? Join the expedition, step into the shoes of Arkham's newest investigator, and see what secrets await the haunted among the ruins of The Forgotten Age!